In the second part of this series I'll cover how to choose a rose the basic types and how to plant them. As the old rosarian saying goes "If you put a $50 rose in a $2 hole it will probably die; if you put a $2 rose in a $50 hole it will survive" correct planting is critical in successfully growing roses. Before purchasing a rose, whether it is from a local nursery or mail order, there are a number of factors to consider. Where will the rose be planted? What type of rose do you want? Will the blooms be used for cuttings? I like to have all of the various forms of roses in my garden… for example, I use climbers to create a border or fence in my beds. Did you know that if you train a climbing rose to grow horizontally instead of vertically it will produce more blooms? You can use shrub roses to divide your beds into “rooms” and miniatures planted in containers placed throughout your garden create an interesting effect. Roses are purchased in one of two ways: either bare root or potted. 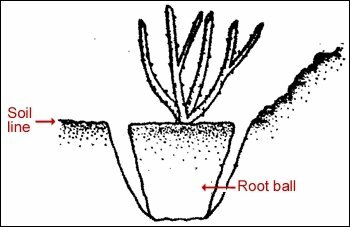 Bare root, as the name implies, means that the plant is shipped without any soil around the roots. Usually wet newspaper or other packing material is placed around the roots to prevent them from drying out during transit. When buying bare root roses buy only #1 grade. Big box and discount stores often sell lesser grades 1½ or 2 for a lower cost. I’ve found out through experience that these lesser grades are inferior in both growth and appearance. Avoid plants that have a wax coating. Stay away from bare root plants that are leafing out. Choose plants with at least 3 thick canes. ARS (All American Rose Selection) and patented roses; they cost more because you’re paying a royalty fee. As soon as you receive a bare root plant in the mail, unpack it and place in a bucket of cool water for 24 hours to allow it to re-hydrate. Subcategories of bare root are boxed roses. These are plants that are packed into cardboard boxes or wrapped in a bag. They have wet sawdust or similar product packed around the roots to prevent drying out. hese are fine as long as the roots haven’t dried out. Make sure the box or bag feels heavy or don’t buy it. If it feels light their roots have probably dried out and chances of survival are slim. Some boxed roses claim that you can plant the rose right in the box. Don’t do it! Remove the plant from the box and plant like a regular bare root rose. The advantages of buying bare root are that the shipping costs are much less. You’re not paying to ship a pot full of soil. Bare root roses are fine as long as they are care for and planted properly. Bare Root rose may be planted in the early spring. 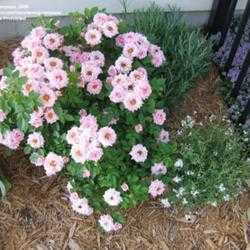 Potted rose are plants that are growing in a pot with soil. The roots have had a chance to get established and the plant has leafed out and may even have blooms on it. If you plant does have blooms remove them as soon as you get the plant home by cutting back to a 5 leaf cluster below the bloom. This allows the plant to put more energy into producing roots instead of blooms until it becomes established. Avoid buying potted roses where the planting mix has been allowed to dry out or shows signs of disease or insects. Inspect the foliage carefully before buying. You don’t want to take the insects or diseases home to infect your other plants. Potted roses may be planted anytime during the growing season. pH in the 6.0-6.5 range. (Get a soil test) amend soil if needed. To plant a bare root rose, dig the planting hole 12-18” deep and 16-18” in diameter. Mix 1 part compost with 2 parts soil removed from the hole. Planting instructions will tell you to plant grafted rose with the bud union (or graft) level with the soil surface. 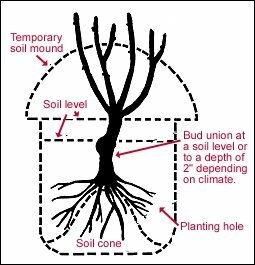 In USDA zone 6 and lower, plant the bud union 2 “below the surface of the soil surface. Sprinkle a handful of bone meal or super phosphate into the hole to stimulate root growth. Mound loose soil 3/4 of the way up the plant until new growth apperas then gently remove this soil. Water and mulch well. Cut the container on opposite sides and carefully remove the root ball. Keep the root ball intact as much as you can. Carefully loosen any encircling roots. Hold the [plant in place and fill the hole 2/3 full with the compost soil mix mentioned above. Fill the hole with water and let soak in. Fill the hole with the remainder of the soil. When planning the placement of your roses, keep the following spacing guidelines in mind. This will allow adequate air circulation and discourage fungal diseases such as powdery mildew. Fertilization will be covered in detail in the next installment, but do not fertilize newly planted roses until after the first bloom cycle.